Although relievers are sometimes ignored by collectors, the earliest Trevor Hoffman cards are not to be overlooked as he enters Cooperstown. Most Trevor Hoffman rookie cards are readily available to collectors of all budgets, but his certified autographs are not as common as other players from the era. This makes his limited signed cards in circulation all the more appealing. 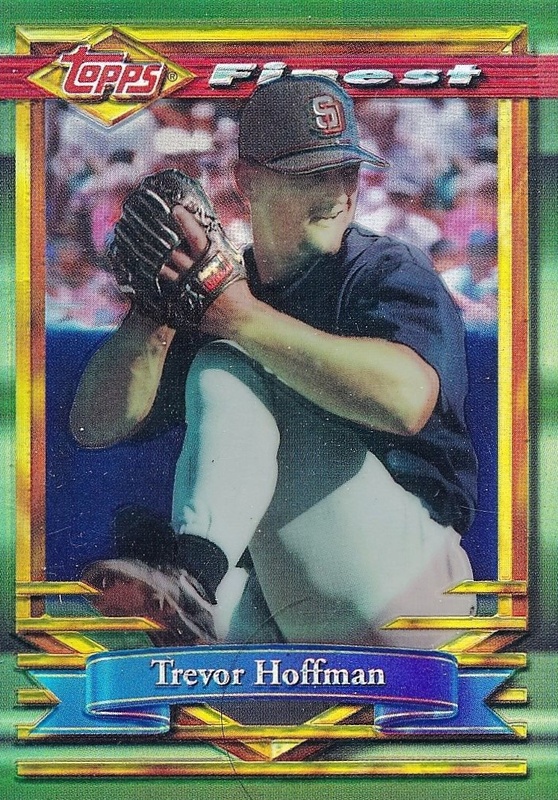 The guide below showcases the best Trevor Hoffman baseball cards from his MLB career, and even a few from his time in the minors. Trevor Hoffman made brief career stops with the Cincinnati Reds and Florida Marlins before being traded to the San Diego Padres, where he became the best pitcher in franchise history. While Hoffman's all-time save record was later surpassed by Mariano Rivera, his career performance was so strong that the National League renamed its Reliever of the Year Award in his honor. Shop for Trevor Hoffman Autograph Cards on eBay. Not as plentiful as his other pre-rookies, the first Trevor Hoffman baseball card documents his days with the University of Arizona. The reverse side of the Tucson Police card actually states "not for sale" and only a few cards have found their way to the secondary market. 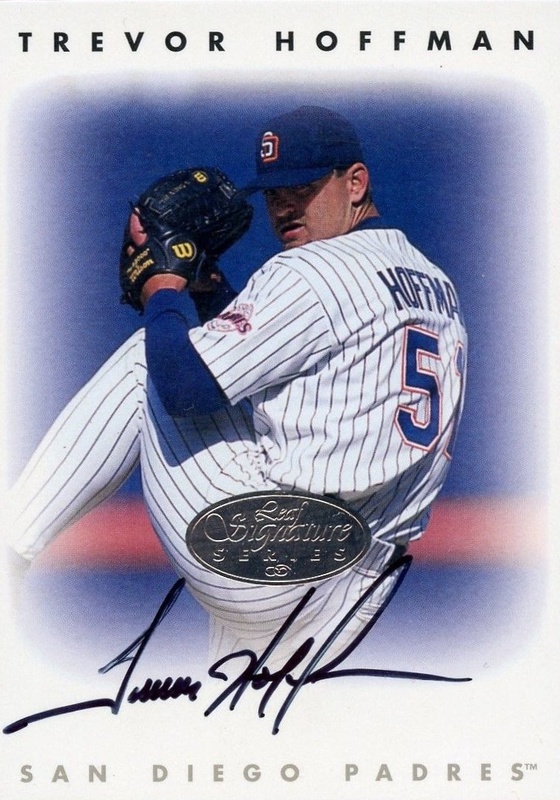 Beyond the two Trevor Hoffman autograph cards that made the list, two other signature cards of note feature Hoffman alongside other top relievers of the 2000s. In 2006 Ultimate Collection, he was paired with Joe Nathan and Jonathan Papelbon, while Hoffman is combined with Papelbon and Eric Gagne in 2006 SP Authentic. 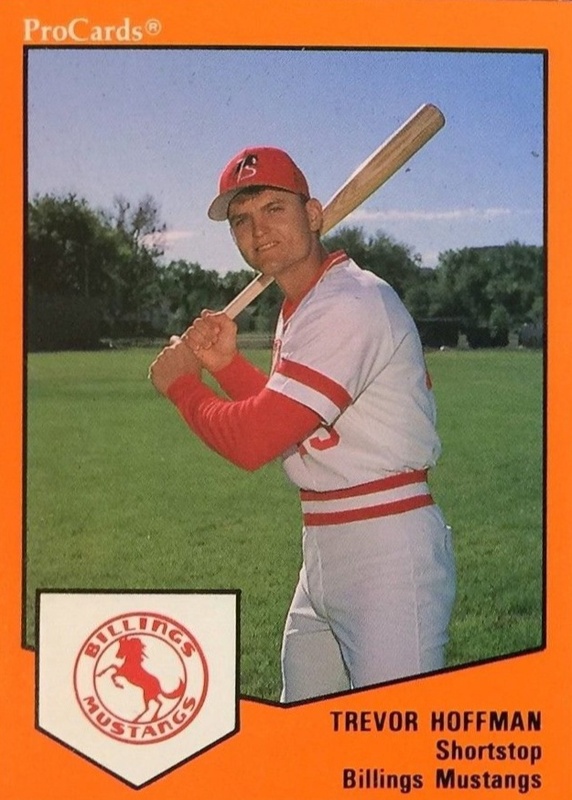 Trevor Hoffman's early appearances and minor league cards offer collectors some of the most budget-friendly options for a Hall of Fame member. Card placement was determined mainly by value, hobby relevance and card design. For Padres fans, the early card to collect for Hoffman is in 1994 Topps as it is his first appearance for the team in a flagship Topps set. Offering a more limited edition, Gold parallels of the set's base cards could be pulled at a rate of one per pack. While rare Black Gold versions were also available, these cards only covered 44 players and Hoffman wasn't included. Trevor Hoffman came to the Padres in a trade that sent Gary Sheffield to the Marlins, and Padres fans actually booed Hoffman during his first appearances with his new team. Up to this point in Hoffman's cardboard career, he was normally listed as a shortstop and frequently photographed holding a bat. 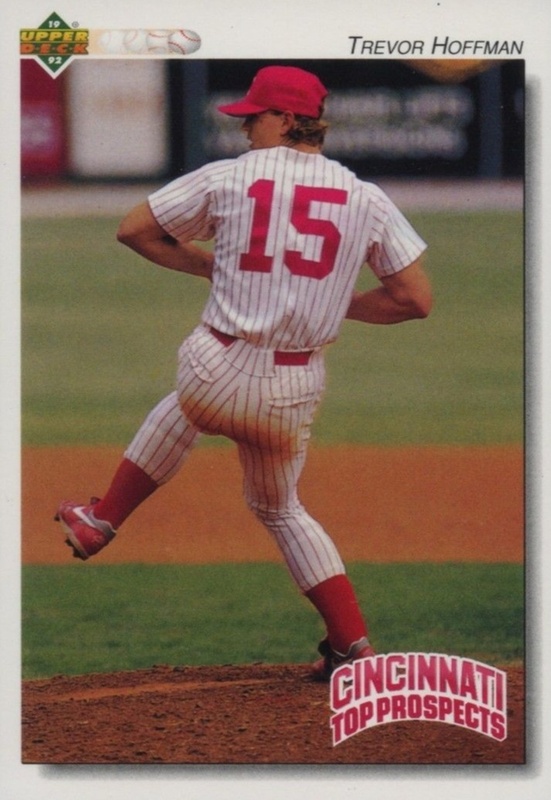 Things changed in '91 ProCards while with the Cedar Rapids Reds. 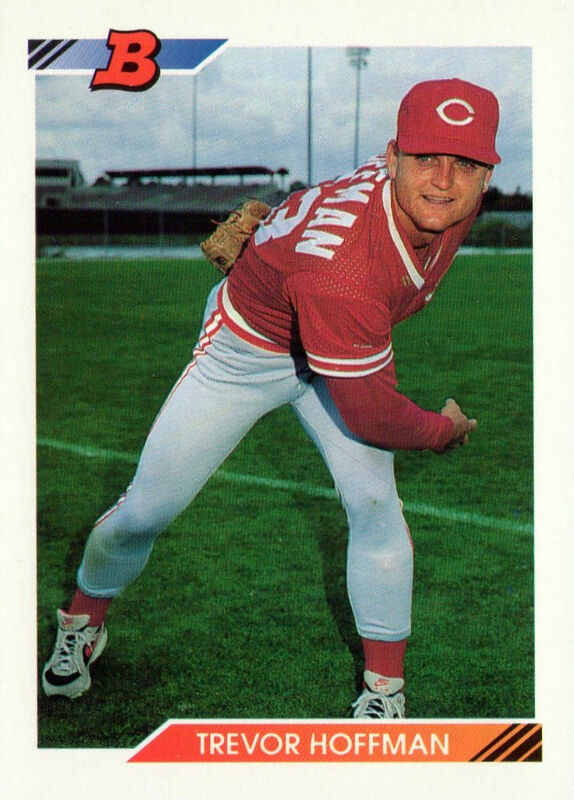 After Trevor Hoffman struggled at the plate during his time with the Reds' single-A team, the Charleston Wheelers, the coaches pushed him to try pitching instead. The rest is history as Hoffman would excel as a relief pitcher. Along with the premium base cards in 1993 Topps Stadium Club, collectors can find two rare parallels of each card in the set. The First Day Production cards feature a silver stamp in the upper corner and were available through packs. These "1st Day" cards averaged around one per box and it is estimated that about 2,000 copies of each card were produced. However, the Members Only cards were available directly to members of the Stadium Club as a complete set. Approximately 12,000 sets were issued by Topps. 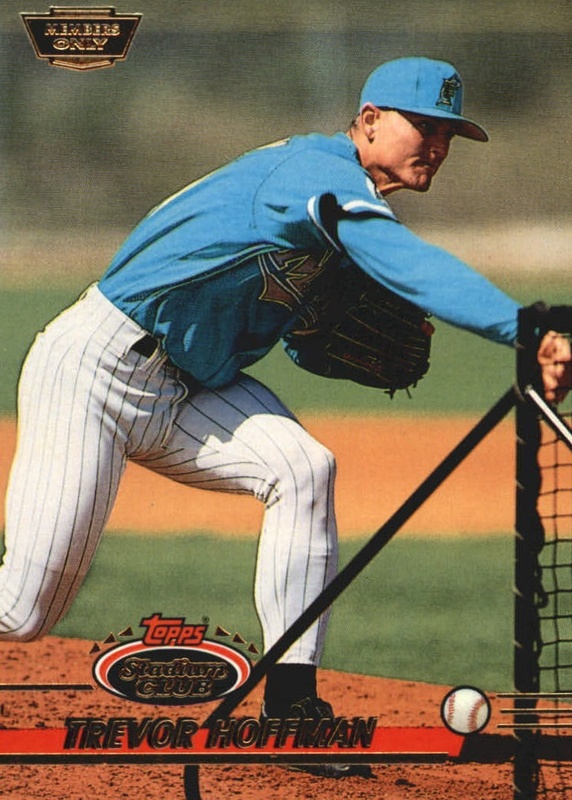 Hoffman wasn't included in the famed 1993 Finest checklist, therefore, collectors should turn to 1994 Finest to find his first appearance in Topps' highest quality set of the early nineties. The Refractors in the 1994 set are actually a harder pull than in '93 as they average 1:10 packs. Along with being more scarce, the 1994 Finest Refractors are also notoriously hard to spot unless you hold them directly under a light to see the rainbow that the refracting causes. 1992 Upper Deck Minor League was UD's first release that dealt entirely with minor league players. Trevor Hoffman's card features a great photograph of him winding up to pitch with the Chattanooga Lookouts AA-team. The '92 UD Minor League set uses a similar design to their flagship 1992 Upper Deck MLB set. As a result, the cards feature the same level of quality with UV-coating and anti-counterfeit holograms, making them some of the best-looking minor league cards ever issued. Hoffman hasn't signed certified autographs for Topps, Upper Deck, or Panini in several years, with the last big supply coming in 2006. Even his relic cards are difficult to find as one hasn't been issued since 2010. Hoffman's signed card in 2004 UD Sweet Spot has become one of his most accessible autographs on the secondary market. The card features a signature on a cut piece of a baseball known as the "sweet spot." While some Sweet Spot autographs signed in permanent marker have been known to fade over the years, Hoffman signed with an ink pen, helping alleviate the problem. It is important to note that while the card is one of his more common signed options, in general, Trevor Hoffman autographs are not very plentiful. The first professional card for Trevor Hoffman came in 1989 ProCards. Issued in team sets, the card highlights his time with the Mustangs out of Billings, Montana. The Mustangs are part of the Pioneer League, which features rookie teams for eight clubs and has been active since 1939. 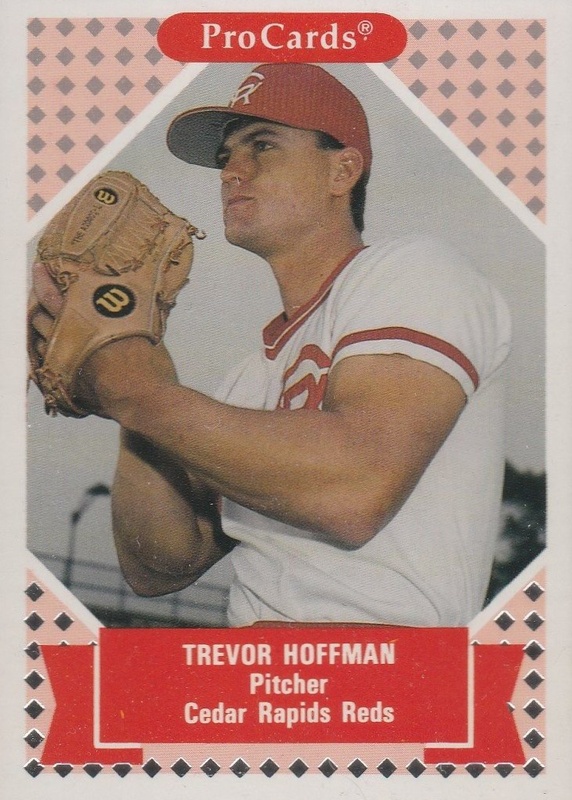 As you can see from the card, Hoffman was still a shortstop prospect at the time and the reverse has no statistical information as he hadn't played professionally yet. Collectors looking for Hoffman's earliest certified autograph can find it in 1996 Leaf Signature Series. The foil logo placed at the center of each card comes in three different colors: Gold, Silver (featured below), and Bronze. Gold versions total 500 autographs, while Silver has 1,000 copies, and Bronze is the most common version with a production number of 3,500 cards. 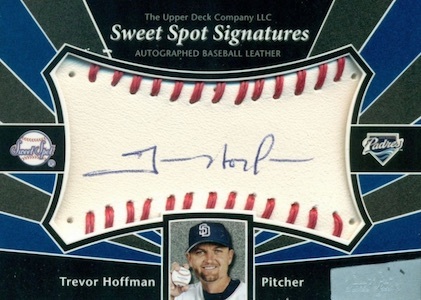 Trevor Hoffman's signature is memorable for its "T" that looks like a "7" or a squared-off "J" and the "f" letters in his last name often look like a capital letter "P."
Trevor Hoffman made his Topps debut in 1993 Topps. He is shown with the same intense stare that hitters would often face when stepping into the batter's box. Hoffman's first Topps appearance can be found in a gold foil parallel and also a gold stamped version that honors the inaugural seasons for the Colorado Rockies and Florida Marlins. Factory sets were sold that feature each card with the Rockies or Marlins logo. For Hoffman collectors, the Marlins-stamped version can be the more appealing one to track down given the direct relevance to his MLB beginnings. 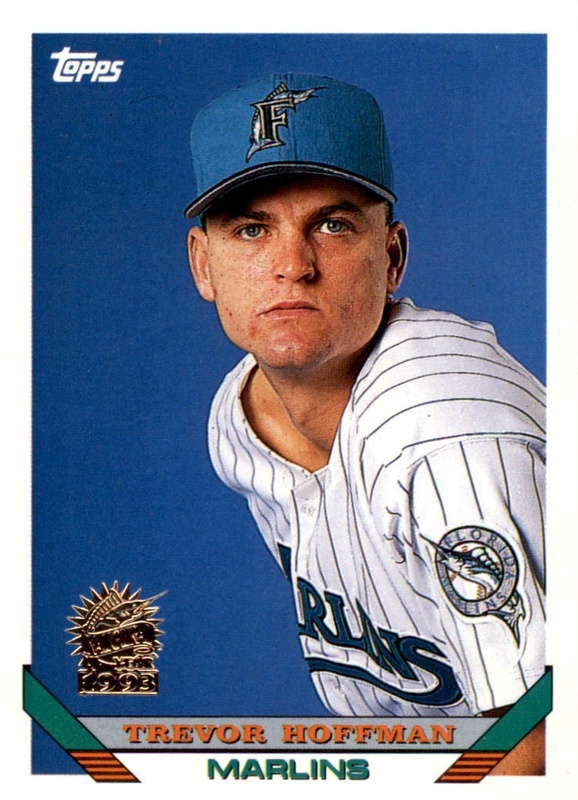 Contrasting his stern 1993 Topps image, the Trevor Hoffman rookie card in 1992 Bowman features a smile for the camera. Bowman continued its tradition of including players in their set who had not actually played in a major league game. 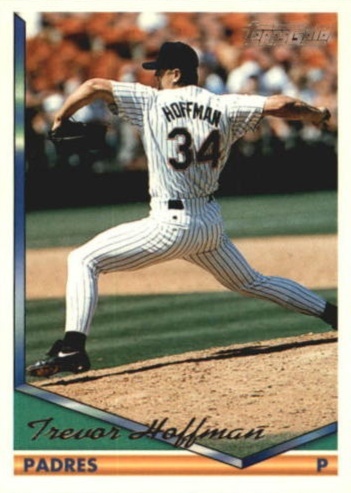 Hoffman would never pitch for the Reds in the majors as the Marlins took him in the 1992 expansion draft. Perfect gem-mint copies of the Trevor Hoffman rookie card can top $100 at auction. Trevor Hoffman #45 Signed 2002 Topps Padres Baseball Card NM! So I see you think the Rockies logo for the 1993 topps card is not worth it even though it is harder to find and worth more. By the way you are wrong, there were 10,000 sets for the Rockies only not the marlins they were given 5,000 sets. What happened was both teams got 5,000 sets at first but the Rockies sold out of them fast enough that topps gave them 5,000 more but said this was it and they would get no more and they sold out of the second 5,000 sets as well where as the marlins could not sell all of the 5,000 they were given.